Light Middleweight prospect 'Phat' Pat McAleese today gave his full support to Erick 'The Eagle' Ochieng by stating that his Ultrachem TKO Boxing Gym mate will easily defeat Lee 'Lightning' Noble this Saturday at the Frank Maloney promoted Jamie Arthur vs Jason Booth Commonwealth Super Bantamweight title clash at the Brentwood Leisure Centre, Brentwood, Essex. The only blemishes on McAleese's otherwise immaculate record have come courtesy of Noble. The first, at Goresbrook Leisure Centre in March last year, was declared a draw by referee Richard James Davis even though McAleese had a superior work rate and had landed the more meaningful shots throughout. The rematch, at Steve Goodwin's excellent 'It' Personal' event in September, had far more at stake, being it was for the vacant British Masters Light Middleweight title. For almost nine rounds McAleese not just outworked Noble, he plain dominated him. Noble's work rate was exceptionally poor, he seemed content to cover up and absorb the constant barrage of punches, only occasionally responding with the odd jab or flurry here and there. In the dying seconds of the ninth round Noble let rip with a peach of a right uppercut. It was a near perfect shot and dropped McAleese on the spot. On learning that Ultrachem TKO gym mate Ochieng's replacement opponent for Saturday's Sky Sports televised event was to be Noble, Newmarket's McAleese was quick to show his support by saying, “I don't think Erick will have too much trouble, he hits hard, he's got a fast jab. When I fought him (Lee Noble) I was eight rounds up going into the ninth round but just got caught by a lucky shot. I think Erick's a little bit more cagey, I think he'll pick Noble off and out work him. Noble'll find it hard because he'll be hitting down a lot, being taller and Erick gets really low. I think he'll find it really hard to fight Erick. Switching tack McAleese spoke a little about his last bout as well as his upcoming fight on March 19th and the possibility of a second rematch between himself and Noble, “Trilogy, I'd like to fight him again. I'm fighting on the 19th March and then I've got a show on the 30th April, which is in Newmarket where I live. I've boxed him (Noble) twice. The first one I thought I'd won hands down but they gave a draw. The last time I was eight rounds up going into the ninth and got caught by a lucky shot. I think a third time I'll want to just put my mind to rest. Neither of them should have been negatives on my record, I just want to set the record straight. I've been working well with Johnny Eames and Brian O'Shaughnessy, who's my new co-trainer. Doing loads and loads of new things. Come 19th March I'm going to come out a much improved fighter. 'Phat' Pat McAleese will next be in action at the Steve Goodwin promoted 'Essex Eruption' event, headlined by Tony Conquest and Yassine El Maachi, at the Goresbrook Leisure Centre in Dagenham, Essex, on Saturday 19th March 2011. 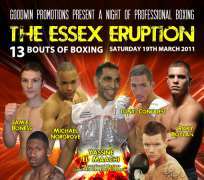 Tickets for 'Essex Eruption' at the Goresbrook Leisure Centre, Dagenham, Essex on Saturday 19th March 2011 are on sale now - priced £35 (Unreserved) or £60 (Ringside).